Over the last few years I’ve had two winter tickets on Swan Valley and both winters were kind to me, landing a handful of fish during both winters to 39.8oz. Following this success I was keen to join for a full season and try my luck at getting a few more of its big old residents during the summer. My season ticket started on April the 1st where I was lucky enough to get off the mark strait away with a mid 30 mirror on a zig rig. 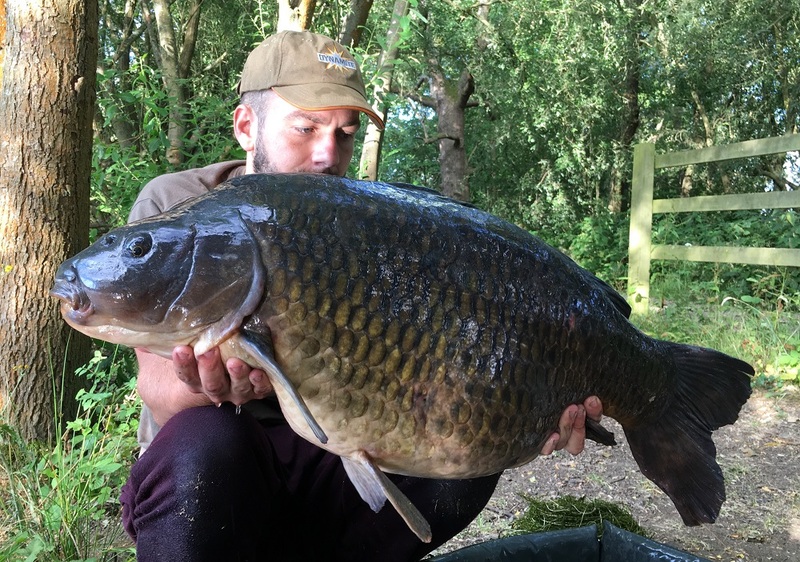 I was soon following this up with a 30lb common off the bottom. I was well happy how my season had started, however, work was hectic and being newly self employed I was keen to take on loads of work. All my work wasn’t in the Yateley area unfortunately making overnighters a headache. This in mind I took a short break from Swan with the plan to return at a later date. 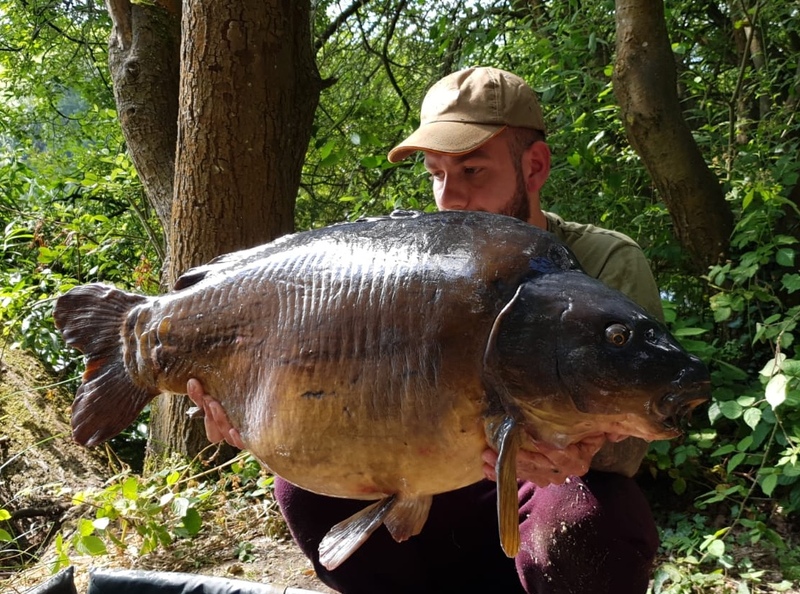 A month or so later work had calmed down, perfect timing as well as Swan had been closed for a couple weeks due to spawning so I hadn’t missed much! I decided to head down to the venue for the day to see what the fish were doing to make a plan for my 48hr trip I had planned for a couple days later. I arrived early around 3.30am and set about walking the pond. It didn’t take long to find fish feeding heavily in two large groups. One group of fish were feeding heavily in the back bay and another in the middle area of the main lake. I cast singles out for the morning but to no avail. It wasn’t long till the sun was out in full force. I spent the morning floater fishing and was lucky enough to get a couple of small commons to 20lb. Come midday the lake was completely void of anglers I decided to make the most of this opportunity to have a marker float about and suss out what the weed was doing! After finding a nice clear area with a better line lay than most swims that also allowed me to fish towards the middle of the main lake I set about preparing for my 48 I had planned. I spombed out a large quantity of bait, a lot more than I would normally. It just felt right to give them a big hit as they seemed to be feeding heavily in numbers out there that morning. Plus I’d like to think they are up for a easy meal after spawning. 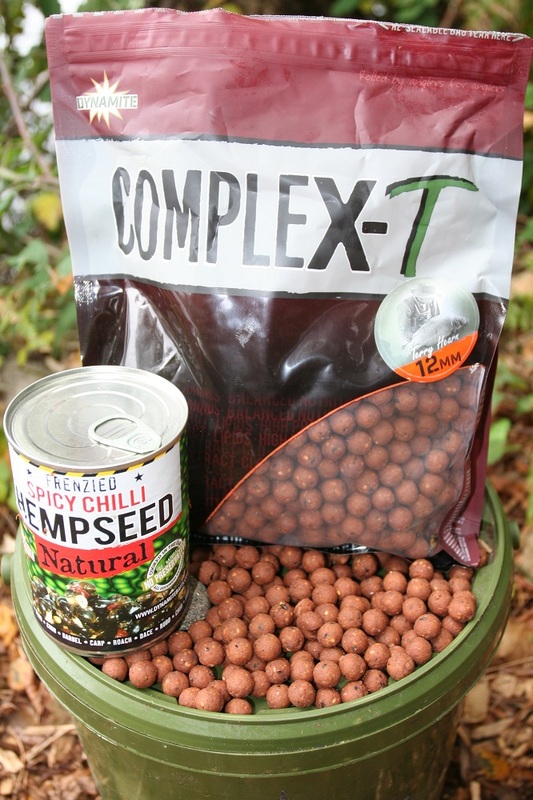 Eight kilos of mixed CompleX-T and Crave was deployed with a further five kilo of Marine Halibut Pellets in 10mm. 13 kilos of bait in total! I arrived a day later and rushed round to the swim I’d baited, to find it free! I was buzzing and to add to my excitement there was fish already feeding on it giving themselves away and fizzing up a treat. I left them to it for the day and just watched. Later that evening the fish had moved off and I went about getting my rigs in position. I was confident there was still alot of bait out there as it was slicking up all the time. The night was quiet without so much as a liner. I found that rather odd and started to wonder if they had done all the bait or just moved off to a different part of the lake. Luckily fish started to reappear around 6am and started fizzing not long later. It wasn’t long before my rod was away, I was weeded up almost straight away and to be honest there wasn’t much of a fight. I just had to slowly pump in a mass of weed hoping there was a carp inside! After netting the mass of weed digging though in my net I was pleased to find a common that didn’t look to small! Now I don’t know if this bought me luck but I had no scales! School boy error, I’d lent them to a friend and forgot to get them back! So I couldn’t weigh the common but I’d say she was a upper 30. Regardless of Weight I was happy. I had one more fish that morning a smaller mirror. The sun was soon out in full force and to be honest I should have spent the afternoon floater fishing, however I was knackered as the excitement the night before kept me up, so a afternoon snooze was in order. Later that evening the rods were re-deployed onto the spot with just 10 spods of bait to top the spot up. The weather had cooled off and it looked really good for the following morning. Again the night passed without so much a beep. I was up early just before first light, to my surprise at first light there was no fish feeding and in fact it looked dead. It wasn’t until 7:30am when they started to turn up again. There was one fish fizzing over my left hand rod for what seemed like hours. I was wondering if my rig was tangled or not sitting right. Thankfully she soon tore off! This fish didn’t weed me up instead she decided to tear me about the pond from left to right this was short lived though and she was soon in the net. 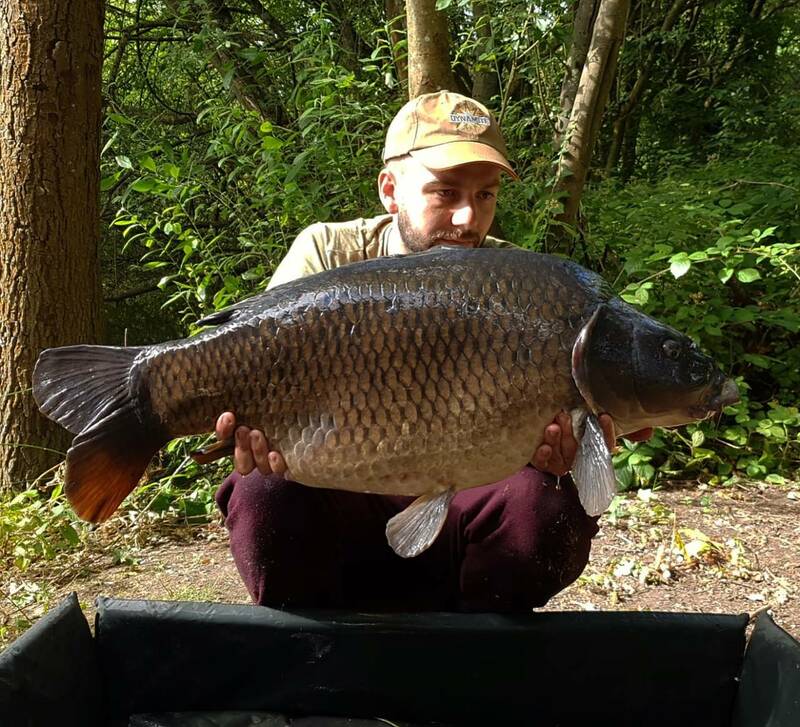 Another common that didn’t look much smaller than the last! I was buzzing two upper 30 commons I didn’t think it could get much better! The swim looked good for another bite surprisingly as the sun had now came out. 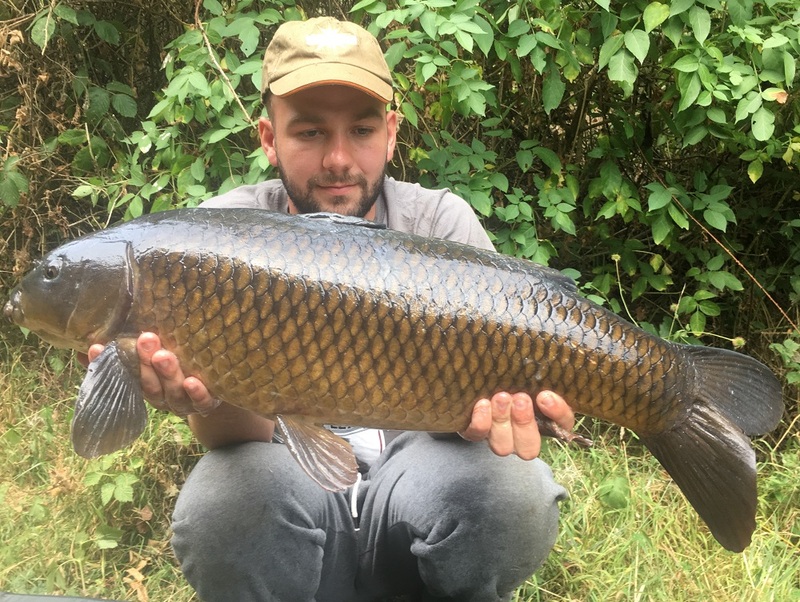 There were a few fish fizzing over the bait so I felt another bite was on the cards. Well in fact I had two! A small mirror and a ridiculously chunky mirror! I thought she was a 40lber in the net so set borrowed some scales of a angler further down the bank. To my surprise she only went 37.8 either way I was still buzzing!